If you thought the Magenta Skytops were a sign that Supra was going soft, you've got it twisted. The skate sneaker brand of 2008 recently collaborated with Deathwish Skateboards, Baker frontman Andrew Reynolds&apos; latest offering. Supra All-Stars Jim Greco and Erik Ellington headline the Deathwish the team, so collabing on Greco's Suprano and Ellington's Diablo (after the jump) is a no brainer. 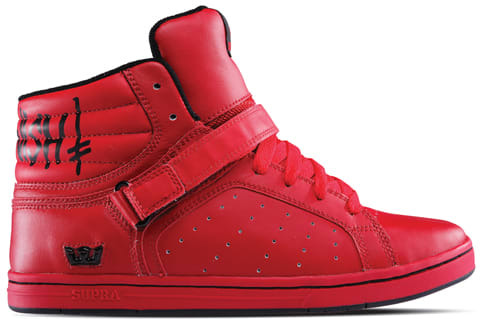 Word from Supra is that the shoes start shipping in the next two weeks.